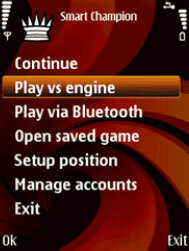 When you start Chess Champion for Symbian the main menu is displayed. Continue allows you to continue an unfinished game. Otherwise this option is not displayed. Play vs. engine allows you to play a game against the built-in chess engine. This option is highlighted in the graphic. Play via Bluetooth allows two players to play against each other. Both devices must be Bluetooth enabled and have Chess Champion for Symbian installed. Open saved game. This allows you to select a stored game for viewing and analyzing. Setup position. You can setup a position either directly on the screen or by loading a position from an EPD (Extended Position Description) file. Manage accounts. In the best Convekta tradition for training software you can create different accounts for different users. For instance, you can create separate accounts for children or create different accounts for various rating handicaps. When you want to begin a new game against the program, select “Play vs. engine” from the main menu. The “Start new game” screen will then be displayed. Here you can either begin the game using the current options or you can change the options before you start. Besides being given the choice of white or black, there are many other options that you can access by selecting “Settings”. 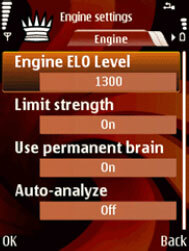 Engine Elo level lets you set the playing strength of the engine. Just keep in mind that rating levels vary greatly between countries and the same applies to chess server ratings. Limit strength. If you turn this option off the engine will play at full strength regardless of the “Engine Elo level” setting. Use permanent brain. This strange term is used in computer chess circles to specify if the chess engine should continue to “think” when it is your turn. The engine will play a stronger game with this option on. This is equivalent to “Ponder on” in some chess programs. Auto-analyze. This option affects how analysis mode works. 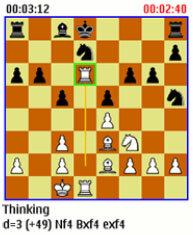 When autoanalyze is turned on, the engine begins to analyze the position as soon as you enter a new move. When it is turned off, you must manually activate the engine. You can see at the top of the menu that this is the “Engine” options page. Using the right arrow (or equivalent) the next option tab, “Book,” is displayed. The only option on this page allows you to enable or disable the so-called opening book. Chess Champion for Symbian comes with a large opening book that needs to be installed separately, but offers much more opening variety than the built-in book. If you disable the book, the engine will base all its moves on its own calculations, which will weaken its play considerably. The next option page, “Time”, is also accessed by selecting the right arrow. This menu allows you to set the time controls for the game. Time control type. You can choose from three different types of time control. 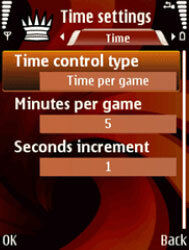 “Time per game” has been selected on the screenshot. This would be your choice if you want to ensure that the game will be over within a certain time limit. If you exceed the time, you will lose the game. For instance, you would use this setting for a typical 5-minute blitz game. You can also select “Time per move.” In this case the chess engine will never use more than the time specified for each move. Finally, “Fixed depth” means that the chess engine will not look deeper into the position than the specified depth. The lower the number the worse it will play. Minutes per game sets the number of minutes that each side has to finish the game. Seconds increment. Many users will welcome this option, especially those who are slow with the small handset keyboard. After each move a specified number of seconds is added to your time (and the chess engine as well). You access the fourth and final tab for the game settings by hitting the right arrow once more. This tab (“Board”) contains various options specifying how moves are entered and displayed, plus the board design. The scrollbar on the right side of the image indicates that there are more options than fit on one screen. You use the navigation keys (also called the joystick) to scroll up and down. Input method. This is the method used for entering the moves. The options are “Joystick,” “Numpad” and “Both”. Animate moves allows you to animate the movement of the pieces from the originating square to the destination square. Board theme. Here you can select from two designs for the board and pieces: “Simple” and “Fantasy”. Highlight moves. If you click on a piece, this option highlights all the squares to which it can move. The additional options that are available on this tab, but not visible in the screenshot are: “Show move arrows” (draws an arrow from the originating square to the destination square of the last move), “Show cell numbers” (controls whether board coordinates are displayed) and “Use symbol numbers”. Some of these options you will set permanently, while others, such as the time control, will change more often. If you have changed an option, just hit the OK button to take you back to the “Start new game” screen and then click the “Start” button, as described above, to begin the game. 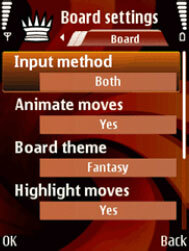 This screenshot shows the default board design (“Simple”). I’m playing a 5-minute blitz game and Black is waiting for White’s first move. Black’s time is shown in the top right corner. The time remaining is shown, since I set the “Time control type” to “Time per game.” At the top left you see White’s remaining time, in this case 4 minutes and 57 seconds. The red color indicates that it is White’s turn. At the bottom left you see the text “Ready,” which means that the program is waiting for your first move. The program will play the first moves out of its opening book unless it has been disabled. When a position cannot be found in the opening book, the chess engine begins calculating its own moves. While it is thinking it displays the socalled principal variation (PV) below the board. Here you see the text “Thinking” and then a line with the best variation the engine has found so far. The line starts with “d=3,” which shows that the engine is looking three “half-moves” ahead. Following that “(+49)” indicates the engine’s evaluation of the position. The plus sign means that it’s in White’s favor and the 49 tells us that White’s advantage is just below half a pawn. The evaluation is in centipawns, so +100 shows a one pawn advantage for White. Similarly, an evaluation of -100 is a one pawn advantage for Black. Finally you see the variation that the engine has calculated. It intends to play Nf4 and expects White to capture the knight. The most convenient layout is to have the board as large as possible, but there are times when it is also useful to see the notation of the game. You can choose from three different board sizes and you can even hide the board altogether and just view the notation. You can move back and forth in the notation when it is visible and even choose a different move at any point. Here you see an example of a smaller board with the notation displayed below. I changed my fourth move from 4.c3 to 4.Nc3 and the game continued from the new position. The “#” button on the keypad switches between the board and the notation allowing you to browse the notation or move the pieces on the board. You can also edit the game header at anytime. For those who are familiar with PGN (Portable Game Notation) you are editing the game tags as shown in the next image. The scrollbar leads to fields such as the time control used in the game. Most of these tags are filled out automatically, but you can edit any of them. You can even add and store your own tags, or delete unwanted ones. Thus, you have full control over what information is saved. If you want to view or analyze stored games, select “Open saved game” from the main menu to display a list of games in the current database. Here you can see a list of the first few games. You can select any game using the navigation buttons and then open it by clicking on it. You can also add your own analysis to the game and save it; when you do so you can replace the game or save it as a new game. If you select “Options” in the lower left corner, you can see that the game database functions are surprisingly powerful considering that this program is running on a mobile handset. Delete game. Deletes the highlighted game in the “Available games” list. Change database. Allows you to switch between existing databases. These can be databases previously created by the program or a PGN database that you copied from your computer to the handset. New database allows you to create a new default database for saving games. You can select the directory in which the database is created and choose a name for it. Note that the program can also read and write EDP files. For instance, you can save the current position to an EPD file at any time. 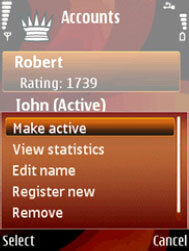 Chess Champion for Symbian allows you to create and track different user accounts; just select “Manage accounts” from the main menu to bring up the “Accounts” page. Make active makes the highlighted user the active account. View statistics. The program collects statistics for each user. It tracks ratings, the number of games played, and won and lost games. Edit name allows you to change the name of the user. Register new creates a new account. 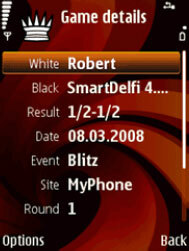 To play a game of chess over a Bluetooth connection, both players need to have Chess Champion for Symbian installed. Each player then makes his moves on his own handset and they are automatically transmitted so both players always see the same position. If you are familiar with how Bluetooth connections are established, it’s easy to start a game. When you select “Play via Bluetooth” from the main menu, you are presented with the screen shown above. This is the normal “Start new game” screen with one new option shown at the top of the menu. Here I have selected that my phone will host the game, so I get to choose which side I play. I have chosen the white pieces. I can also select other settings, as described previously. Then I start the game as normal. This time, however, I will get the message “Waiting for opponent”. The other player must set the option “This phone will” to “Join game”. When he does so, the option “Your side” will disappear from the menu, as he must accept the choice made on the phone that is hosting the game. Finally he selects “Start” and the game can begin. Convekta offers many different programs for various types of mobile devices. 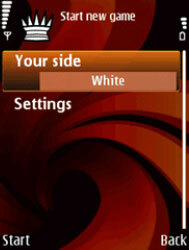 Pocket Chess Champion runs on Pocket PC and could be called the big brother of Chess Champion for Symbian. 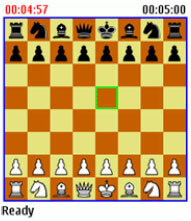 There are also programs for playing on ChessPlanet and the ChessOK servers. Additionally, most of their training programs are available for Pocket PC, including a version of CT-ART.